... to the world of Micro Artwork's high precision paper scale models. Either you are a paper modeler looking for the challenge of your life, or you are a space enthusiast searching for extremely detailed scale models, or you just want to enjoy the pictures and stories about the moon landing hardware - you came to the right place! If you are already happy owner of a 1/96 Crawler Transporter kit, welcome back ! Feel free to check out the support section, if you need some hints for assembling your Crawler or if you want to read the latest news and updates about the kit. If you are curious about the oncoming LUT, take a look to its progress. 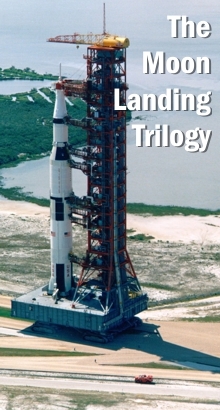 aims to model the three major components of the moon landing hardware - the Crawler Transporter, the Launcher Umbilical Tower and the Saturn V with the Apollo spacecraft - mostly from paper at an intended accuracy of 1 inch / 2.5 cm. Is this even possible ? The short answer is - of course not, when we talk about the complete hardware including all its internals. Besides the sheer amount of structures it would be nearly impossible to collect and study all necessary drawings and references. However, you’re invited to look for yourself how close the Crawler Transporter model, the first finished part of the Moon Landing Trilogy, comes to this ambitious aim. In the Pictures Gallery you find pictures from the finished model as well as from the construction process. If you want to learn more about the model kit, look here or click on the picture in the navigation bar at the top of the page. But take care - you eventually might find yourself ordering a kit ;) ! 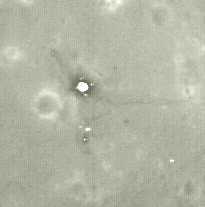 The picture to the right stems from an image taken by the Lunar Reconnaissance Orbiter (LRO) in 2010. It’s the landing site of Apollo 11 at the West crater about 500m away to the right (North and South are upside down in the image). The small crater 50m to the right is ‘Little West’. The image to the right clearly depicts the descent stage (about 12 feet in diameter), that was left behind as well as the astronauts' tracks and the various equipment they deployed. Launcher Umbilical Tower atop the Crawler Transporter on its way to the launch pad. The first part of the project, the Crawler Transporter, is now available after a development time of ten years.